Above all the Gods who come and go in the consciousness of man through the rise and fall of civilizations, in the abode of infinite space, in absolute peace where time is no more, there resides the Great Mother of all creation, one with Her Lord, the Supreme Spirit. The Great Goddess, matrix and creatrix of all that is, takes as many forms or aspects of manifestation as the human mind can conceive. Within and without, it is always She who weaves the patterns of all life as the Divine Force behind everything perceived by the senses. She is Universal and has many names: we call Her Haidakhandeshwari. 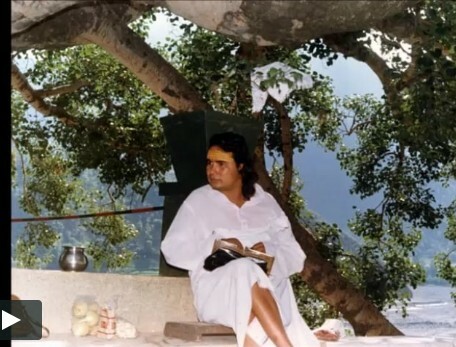 Shri Babaji said, "The Great Power that is the cosmic Maya, the Supreme Divine Energy, the Mother Goddess of Haidakhan embodies the totality of all that is to be known. She is the combined divine Grace Energy of the Goddess Maha Kali, Maha Lakshmi, and Maha Saraswati. To worship the Universal Goddess while we are in this mortal frame gives human life its highest realization." The concept of the Divine Mother is universal. Goddesses are respected and worshipped in many traditions, such as that of the Native American Indians, who see Mother as the Earth and treat Her with respect and love. Haidakhandeshwari is the Shakti, or female aspect, of Haidakhan Babaji. She is the energy that resides in His heart. 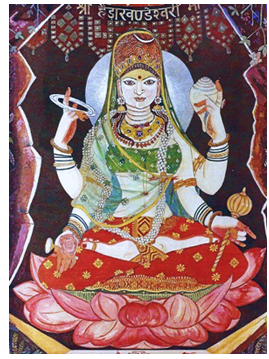 Her physical form is based on a vision She gave to a devotee in India. The painting made by this devotee is the one shown at the top of this page. Each of the Haidakhandi Temples of the world has a Haidakhandeshwari statue or murti residing within it. Each is named one of Her specific names, signifying some aspect of that particular statue's divine personality. For instance, in Schweibenalp, Switzerland Center of Unity She is called Siddheshwar (Mother of Special Yogic Powers); in Asti, Italy, near Milan, She is named Annapurneshwar (Mother of Food and Fulfillment); in Nebraska, She is named Rajeshwari (Queen of the Godesses); in Crestone, Colorado, She is named Vishveshwari (Universal Mother); to name a few. She is shown with four arms. In Her upper left hand, She holds a conch. This a symbol of the sound of creation, and therefore, of Her creative powers. In Her upper right hand is a chakra, a weapon with jagged edges that cuts like a sword. It is She, the loving Mother, who protects Her children from enemies, both outer and inner. She holds a mace in her lower left hand, a symbol of authority. Her lower right hand is always extended in a gesture of blessing to all those who come to Her. To worship the Divine Mother is a very high practice. She bestows all blessings and prosperity. "The Divine Mother is the one who gives us everything in the world. To Her you should offer your love, your devotion, your worship, your work. You should offer everything to Her and feel grateful that you are given the chance to live in this world, because it is Her grace." "You have all the material things you could ask for: lovely homes to live in, beautiful cars to travel in, good clothes to wear, everything the material world can offer. But unfortunately you lack one thing: the peace of heart and mind. To get that peace you run here, there, and everywhere looking for it. You will find it only in the place of the Divine Mother." Make your heart a residence of the Divine Mother by reciting her Name (Mantra) and singing devotional songs dedicated to the Divine Feminine.